Bertrand Sinclair was born in Edinburgh, Scotland and came to North America in 1889. He began his prolific writing career in 1902 when he sold an article to a San Francisco newspaper. Sinclair wrotes frequently about cowboy life, drawing from his personal experiences in the late 19th century working as a range rider in Montana. When Sinclair came to Vancouver in 1912, his work assumed a West Coast orientation in which outdoor activities, fishing, and logging played an important role. Pender Harbour, BC became his home in 1922 where he continued to develop themes pertaining to the relationship of character to environment. From 1905-1940 he wrote 11 "novelettes" and over 60 stories, one of which was turned into the film Big Timber in 1917. He later published two more works in the early 1950s. By this time, Sinclair's interests had largely shifted away from writing. He spent his later years enjoying pursuits such as commercial fishing. 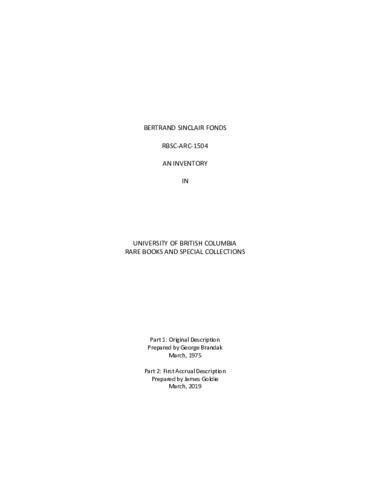 Fonds consists of correspondence pertaining both to business matters and to Sinclair's writing (1905-1946), as well as personal correspondence with family and friends. Also included are manuscripts of short stories, novelettes and novels. Printed material contained in the fonds includes short stories, poetry, novelettes and novels. Fonds also contains photographs and photographic negatives, as well as log books, notebooks, maps/guidebooks, and ephemera. Original accession received by creator's partner, Ora Sinclair. Accrual received by creator's granddaughter, Jane Whitaker Moloughney. Accrual received in 2018. No further accruals are expected. Original inventory compiled in 1975 by George Brandak. Updated with accrual in 2019 by James Goldie.